Time to decorate the house & yard with fun Halloween gear. 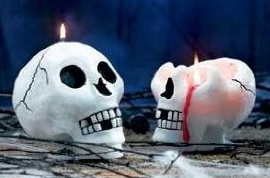 Like this super neat bleeding skull candle made from 100% all natural palm wax. This eco-friendly candle is 4 7/8″ x 3 7/8″ x 4 7/8″ high and will actually start to ooze a realistic blood-like red wax after about 30 minutes of burn time. The kids will love it!